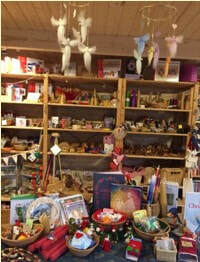 Welcome to our new Community Space and School Shop …..
Our beautiful School shop sells a variety of Waldorf/Steiner books, toys, craft materials, seasonal decorations and snacks. It also houses the Treasure Chest, which sells pre-loved good quality clothes for adults and children. The shop welcomes new volunteers, no experience necessary. The Community Space is open all day during the term from 8.30 to 4pm. ​It is available as a drop in social space for all members of the school community. It offers hot drinks (by donation), a cozy corner for children and the parents library. 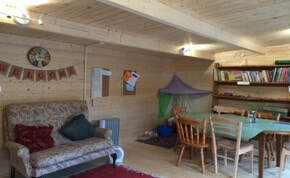 It is also hosts a variety of activities such as a Steiner Study group, and German lessons for children. It is available for hire at a cost of £5.00 an hour (booking via the school reception). A toilet and baby changing facilities are also on site. Both buildings are located at the far end of the top car park. Please come and visit us.